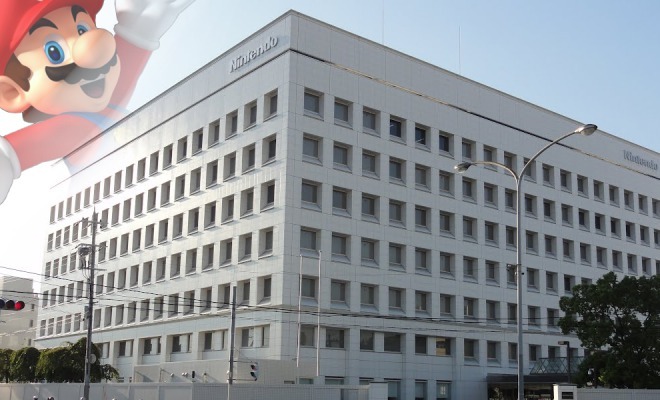 Earlier yesterday, Nintendo released their 3rd Quarter Financial Results Briefing. It’s a lot of awesome statistics and juicy information, but there’s also a ton of slides and paragraphs to shift through. If you want to take a crack at reading the four pages, go for it. If you want just a quick overview, stay with me for just a few minutes. I’ll take you through the highlights of Nintendo’s 3rd quarter financial results . The first major point in the briefing is the Nintendo 3DS system. As of the briefing, the family of 3DS hardware units have sold over 50 million units. 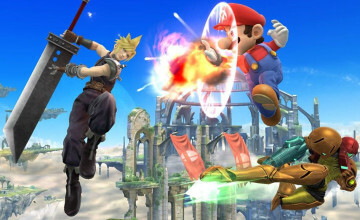 Nintendo originally expected the system to see 4 game titles to hit double-million sales. Instead of 4, the company saw 5 titles hit that mark. This is the first time since 2000, and possibly the first time in history for the Japanese market in video games, that dedicated platforms have seen this achievement in their software. Out of these 5 titles, 3 of them were third-party games. Nintendo is aware that theories exist revolving around the idea that smartphones will cause the software business to decrease. In their case, however, they are experiencing the opposite. Developers who originally intended to publish their games on smartphones are finding interest in the 3DS and bringing their ideas to life via the handheld instead. 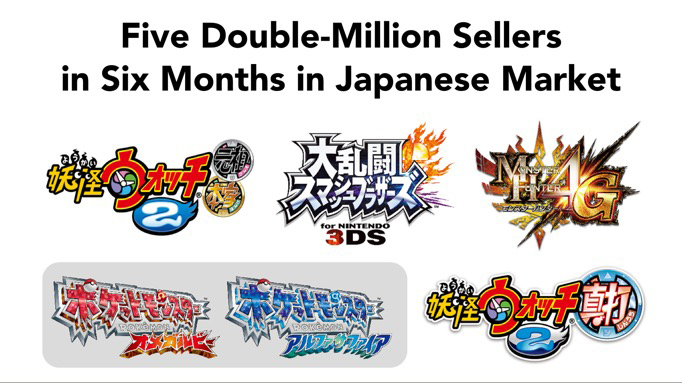 One example is the popular title Puzzles & Dragons Z.
Super Smash Bros for Nintendo 3DS sold 3.22 million by the end of it’s first month. By the end of the year, that number reached 6.19 million units. There were skeptics based on the idea of a primarily console related game becoming part of the handheld series, but the sales have been phenomenal (with higher sales in Japan and the U.S.). The above chart shows the preliminary sales for the newest addition to the 3DS family. 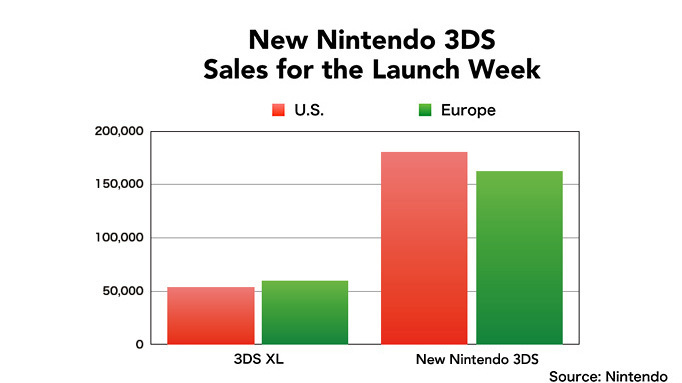 The chart shows the comparison between the 3DS XL and New Nintendo 3DS launch week. 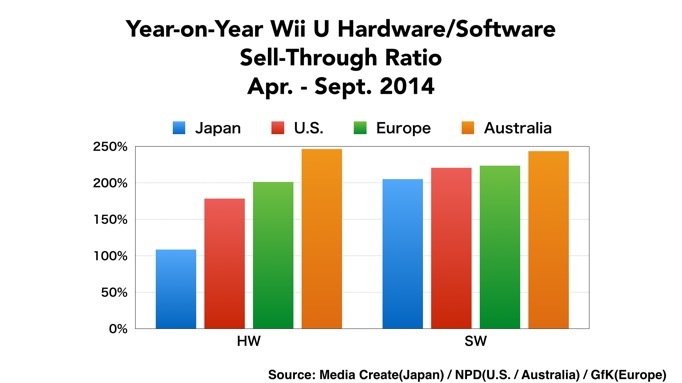 Even though the launch occurred during off season, the sales were very good in both U.S. and Europe. Nintendo touched base on a couple last remarks for the 3DS. 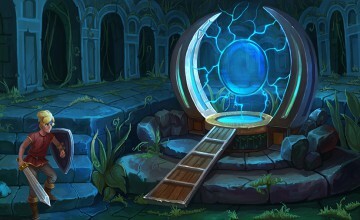 Development plans are on the table for more games, but they were not announced in the briefing. Also, the company plans to promote Local Play which has helped franchises such as Pokemon and YOKAI WATCH in Japan. Next, the briefing moved onto the Wii U. The chart above shows sales through the months of April and September. The improvements to the sale figures is the result due to the release of Mario Kart 8 and the consideration for the Wii U after E3. As the year progressed, sales increased in the United States. 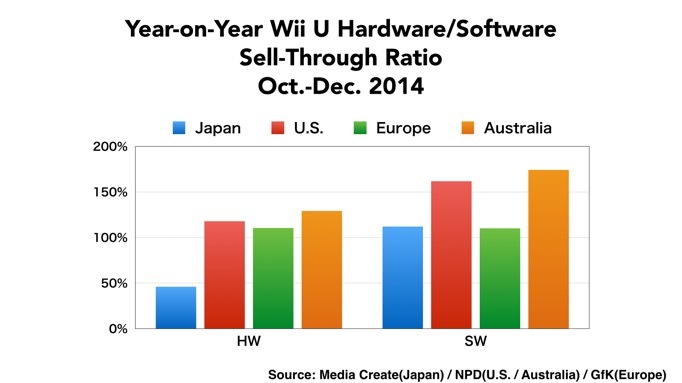 Hardware sales are shown to have increased outside of Japan, but domestically the sales figures dropped. Nintendo believes this is due to the new 3DS gaining more attention over the Wii U from consumers, resulting in the decline of hardware sales. 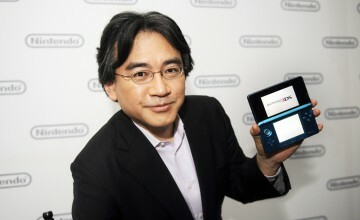 Nintendo previously announced that they were going to fully utilize the Wii U’s game pad for future games. 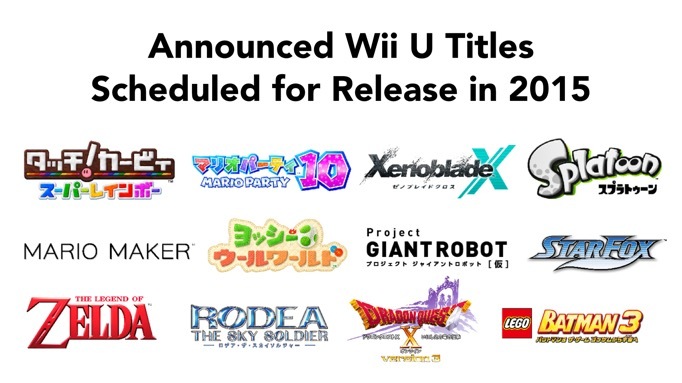 This slide shows titles that are scheduled to be released this year that will do just that. Nintendo is also hoping that User Generated Content in games like Mario Maker will give parents and their children more options to have fun together. 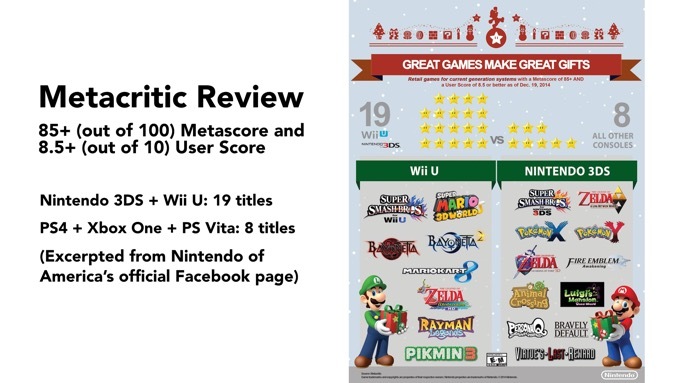 Metacritic was also mentioned in the briefing with a slide showing a recent poll from the website. Nintendo has 19 video games listed on the review with games that met the Metascore 85 and above while also maintaining a User Score of 8.5 and above. Interesting enough, other systems such as the PS4, PS Vita, and Xbox One only had 8 titles in total. If that wasn’t enough food for thought, Nintendo also delved into amiibos during the last part of the presentation. As of the meeting, 5.7 million units have sold worldwide for the franchise. U.S., Canada, and Australia have the highest performances with the figures. Nintendo states that no one saw it coming when some of the amiibos would sell out quickly only to be resold at higher prices online. The next series of amiibo that Nintendo will be releasing is the “Super Mario” series, created to be compatible with the new installment of Mario Party (we finally made it to number 10). Since more and more amiibo will be coming out, Nintendo realizes that store space is limited, so certain amiibo will be replaced when they are sold out. Fear not, though! The company stated they will consider more production for certain amiibos if there is a lot of requests for it or if it sells out very quickly after its launch date. Nintendo also gave us some nifty charts to see how the amiibos are doing both in sell-through rate and the region’s top sellers (not the same as the demand for the figurine, mind you). 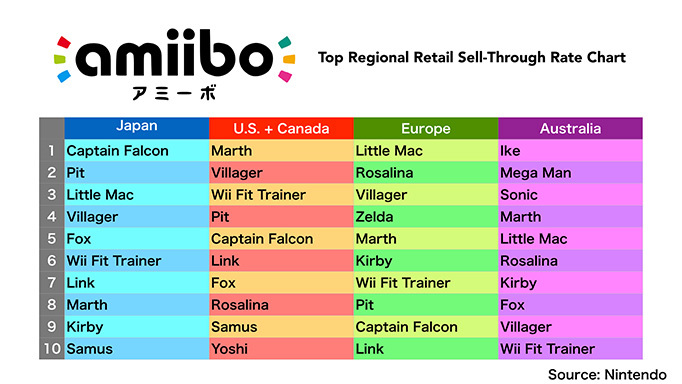 It’s no surprise to see the Marth, Villager, and Wii Fit Trainer amiibo at the top of our territory’s list for the sell-through rate. On the other they list, Link, Mario, and Pikachu are our top sellers as far as how many are sold throughout the country. To wrap it up, Nintendo discussed a little more about their future plans for the figures. Amiibos will be starting to come in the form of cards as well this year. Along with the cards, there will be a free download for Wii U systems to play NES and SNES highlights with your amiibos.